When responding to an accident involving livestock, a lack of understanding can make the situation worse. MANHATTAN, Kan. (May 19, 2010) — A motor vehicle accident involving a big rig or stock trailer loaded with cattle can quickly go from bad to worse, depending on how humans respond. Animals trapped within the wreck or spilled onto a highway create a volatile situation. Law enforcement and other emergency personnel often are ill-equipped to handle the dangerous mix of traffic, frenzied human activity and frightened, unpredictable and perhaps injured cattle. First-responders need to make the right decisions when dealing with an accident involving livestock, Jennifer Woods said, giving examples of "the right decisions." 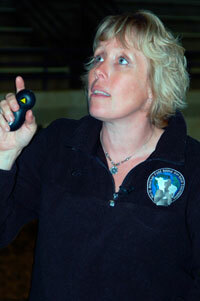 During the International Symposium on Beef Cattle Welfare, hosted by Kansas State University, animal behaviorist and consultant Jennifer Woods discussed the need for education in livestock emergency response techniques. Based in Alberta, Canada, Woods has traveled across North America and abroad to deliver emergency response training to police and animal-control officers, firefighters and others who might serve as first-responders to accident scenes. According to Woods, the most common problems associated with animal-related accidents include a lack of understanding of distressed animal behavior, a failure to plan ahead, and ineffective communication among responders. Another problem is too many people on the scene, including media representatives and curious onlookers. Woods said preparedness for accidents involving cattle means having access to resources, including portable panels to erect a containment structure for loose animals, and assistance from experienced livestock handlers. Another potential option for containment is herding animals to pasture or pens of a nearby farm or ranch. If animals must be unloaded from a truck or trailer, she warned against releasing animals onto a highway, creating a more dangerous situation and potential liability issues. Depending on the situation, it may be necessary to have stock trailers on standby in case cattle must be transported to another location. Woods said a veterinarian may be needed to provide treatment or euthanize injured animals, and a renderer may be needed to remove dead animals.